Autumn’s coming and that means darker days. The perfect plan for a cold and rainy day is a long bath, treating yourself with natural and homemade creams, soaps and salts. Today’s DIY is a herbal body salt that smells very refreshing and delicious, a mix of spearmint and rosemary, just what you want after a bath. We found this DIY on Minted (one of our favorite DIY websites) and the creators are Sara and Melissa from Alice & Lois, check out their web, they have very nice DIY and recipes. The steps are very easy and you don’t need much time or supplies for this DIY. To find the ingredients we recommend you to check at your nearest drug/soap store. You can also find some of things at a pharmacy. 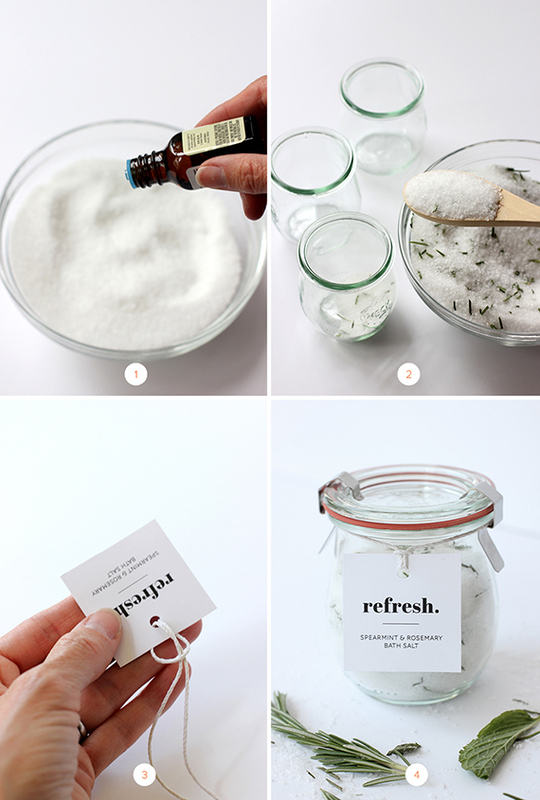 Step 1: First you have to mix the Epsom salt and the sea salts (two cups only). 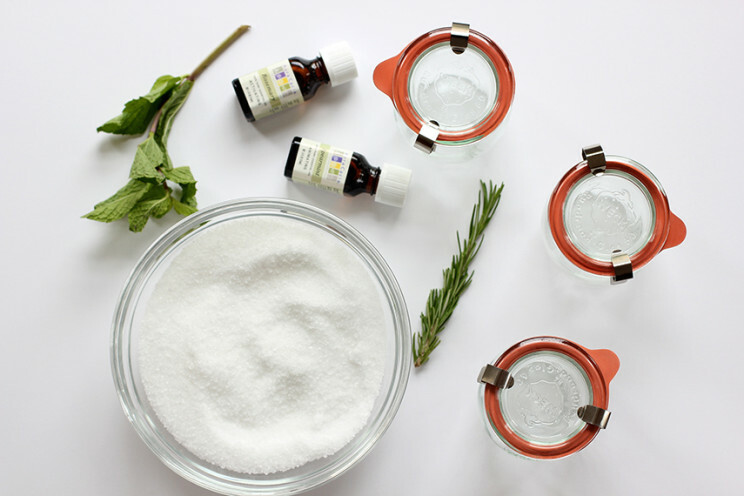 After mixing the salts add 10 drops of spearmint oil and 5 drops of rosemary oil; shake the salts and the essential oils in a ziploc bag. Step 2: Add the dried rosemary and shake again. Step 3: Pour everything into a nice glass jar or something similar. 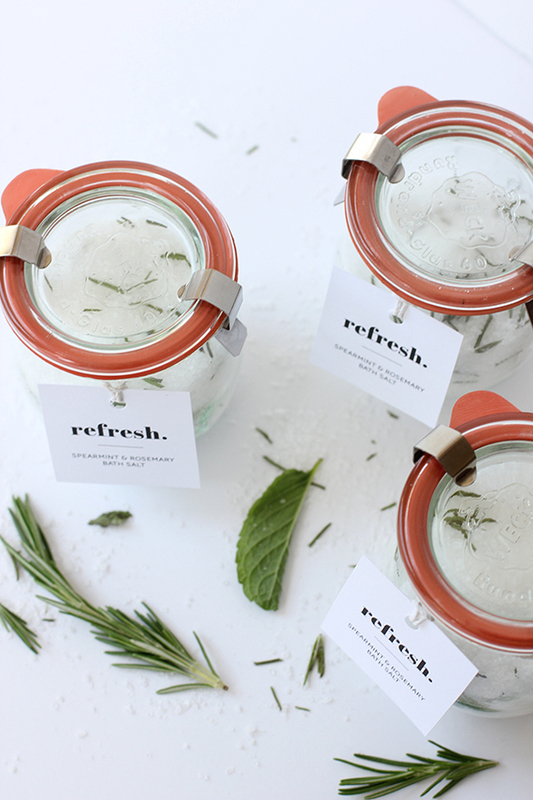 Step 4: Take a bath and use your very own DIY Body Salt. Paso 1: Mezcla la sal de Epson con la sal marina (solo necesitarás dos tazas en total). Después de mezclar las sales añade 10 gotas de aceite de hierbabuena y 5 gotas de aceite de romero. Introduce todo el una bolsa de plástico ziploc y agita el contenido. Paso 2: Añade a la bolsa el romero seco y vuelve a agitar. Paso 3: Vierte el contenido a un tarro de cristal o algo parecido. Paso 4: Disfruta de un baño probando tu propio exfoliante casero.